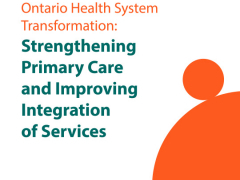 Ontario must strengthen primary care to prevent disease, improve outcomes, save money and build a foundation that focuses on patients and helps them navigate the system seamlessly. To be at their best, primary care teams must include 4,500 RN care co-ordinators who have been working for LHINs. To manage care effectively, Ontario health teams must oversee primary, home and community care and support those with mental illness and addiction. To optimize care and make it sustainable, Ontario Health must plan and fund our system and be held accountable for its performance.